Home » PIllows » What’s the Absolute BEST Memory Foam Pillow Overall? If you are looking to buy a new memory foam pillow, you might find our review of some of the best memory foam pillows useful. First, however, let’s see just why memory foam is so popular. Moldability. Sitting atop the list is its ability to mold itself to your body shape and then regain its original shape immediately after you move away. As memory foam takes the shape of your body, it is able to distribute your weight across its surface better, thereby providing better support and reducing unwanted pressure points. This is the reason why you feel your head cradled so nicely when you lie on top of it. A buyer’s tip: Check the pillow’s firmness before you buy. If the pillow is too soft, your head will sink too deeply into it, throwing off the head, neck, and spine alignment. Misalignment, in turn, can lead to pain. You might also feel awkward lying with the head sank too deeply in the pillow and have difficulty falling and staying asleep. Durability. Memory foam pillows last for many years, at least all the good ones do. Once you’ve found a suitable pillow, you’d naturally want to keep it with you for as long as possible, so this is an important advantage—or not if you get bored of things quickly, even the good ones. A buyer’s tip: Density per cubic meter, among other things, tells us about the quality of memory foam. Anything less than 3 lb per cubic meter means the pillow will not be firm enough. A reading of 4 lb or 5 lb means the pillow is likely to have good firmness and last longer. A 5 lb pillow, experts believe, outlasts a 3lb pillow by as many as 10 years. Dust mite resistant. The inorganic fibers of memory foam offer no food to bugs, and that’s why they stay away from it, which is great news for asthmatics and allergy sufferers. A buyer’s tip: Look for memory foam with the Certipur-US certified seal. It confirms that the memory foam is produced using safe materials and procedures. You will, however, have to pay more for better safety. Getting used to it takes some time. If you are using the memory foam for the very first time, you might find its firmness uncomfortable, at least for a few days. In comparison to down feather pillows or some other varieties, memory foam is usually firmer. A buyer’s tip: Opt for a pillow with medium firmness as they are more comfortable. You can also opt for pillows with 2-in-1 design. Such pillows have one layer of memory foam and another of something else, like fiberfill. You can switch back to the softness of fiberfill when the firmness of memory foam becomes bothersome. This duality makes the transition to memory foam smoother. Breathability. Heat build-up is an issue with memory foam pillows, especially when the room temperature is warm. A buyer’s tip: Open cell memory foam breathes better and regulates temperature more effectively than regular memory foam. Another option is memory foam gel. It gives you all the benefits of memory foam, while tiny gel beads ensure improved air circulation, keeping your head comfortable and cool. Also pay attention to the choice of pillow cover. A bamboo velour cover works well on memory foam pillows because it improves airflow. Smell. NASA guys are smart and have done splendid things, but couldn’t they have found a way to get rid of the yucky smell of memory foam? (Memory foam, if you didn’t know, is their invention.) And the sad part is that no one else has succeeded or perhaps tried, and we have to suffer for their lack of smartness. For a few days expect your newly arrived memory foam pillow to smell badly enough to fill the entire bedroom with its plastic smell. A buyer’s tip: Perform the listed steps in the order to dissipate the odor sooner. Air it out for a few hours in the open, if possible; otherwise, prop it up against a chair close to a window and leave the window open. If smell is still bothering you, sprinkle some baking soda over it and let the pillow sit out for some time, following which brush off the baking soda using an upholstery brush. If the smell is still a bother, use a room refresher. White vinegar is a good choice for this. Place a bowl of it in the room, and it will soon absorb the off-gases and odor. The Coop Home Goods pillow is firm enough to provide the much-needed support to your head and neck but not so much to make sleeping on it difficult. Coop also makes our top pillows list with some of our favorites. Another important advantage of this pillow is that it doesn’t get warm. You don’t have to worry about waking up in the middle of night with beads of sweat on you head. The pillow comes with a 5-year warranty against going flat. This tells me two things: The manufacturer backs its product, and, more importantly, I can change it if it turned out to be a bad apple. The product image of this pillow in Amazon proudly displays “Made in the USA”. If this is important for you (it is for me), you might want to check out this pillow. All in all it might be a good option for you if you are looking for a memory foam pillow. Of course, like all memory foam pillows it does smell. You will have to air it out for some time when you open it. The Z Nanobead Pillow molds itself well to your head and neck, providing good support. Thanks to its nano beads, it feels and contours your body better than normal memory foam. Nano beads also improve its temperature regulation ability by promoting continuous airflow. You are sure to feel comfortable and cool lying on it, even if the room is little warm. The pillow cover is half bamboo velour and half spandex, a combination which does make the cover soft and comfortable. Another good thing about is that it comes with a 3-year warranty, something which many users look for in a memory foam pillow. My only gripe with the Z Nanobead Pillow, apart from the smell, is that it does take some time getting used to it. Initially it feels more like a hardened version of a bean bag than a comfortable pillow. But once the body gets used to it, you do enjoy the comfort and support it offers. The Stunning Abode Memory Foam Neck Pillow is neither too hard nor too soft. It is just about the right firmness level. And this is good news for those who like the comfort that memory foam provides but don’t use it much because of its extra hardness. First time memory foam users will also find the transition easy. This pillow is great for side sleeping, but that doesn’t mean it doesn’t provide good support to back sleepers. However, some may find it a little small, especially those who toss and turn frequently in sleep. The pillow has a density of 3.25 lb, so it is decently thick. However, those used to denser and thicker memory foam pillows may find it a little thin. The pillow cover is soft and comfortable, largely due to 40% bamboo content in it. The pillow cover is machine washable, so that’s a good thing. As far as the pillow is concerned, you will have to spot clean it. Thanks to its 3 lb density, the Pinzon Pillow cradles the head and neck well. You might it very useful if you have neck or shoulder pain, as it helps reduce pressure points. However, some may find it too soft. The pillow features an integrated gel pad that prevents heat build-up. It didn’t really feel cool, but it also didn’t get warm. The cover is soft and machine-washable. Just zip it off whenever you want to clean it. You can toss it into the dryer after washing. As it is memory foam, allergy sufferers can use it safely because memory foam is naturally dust mite resistant. Its smell is a huge turn-off. Most memory foams usually stop smelling after a few days. This one, however, attacks the nostrils with hard even after a few weeks. All in all, it is a good pillow, giving good support without feeling too firm like some other foam pillows. 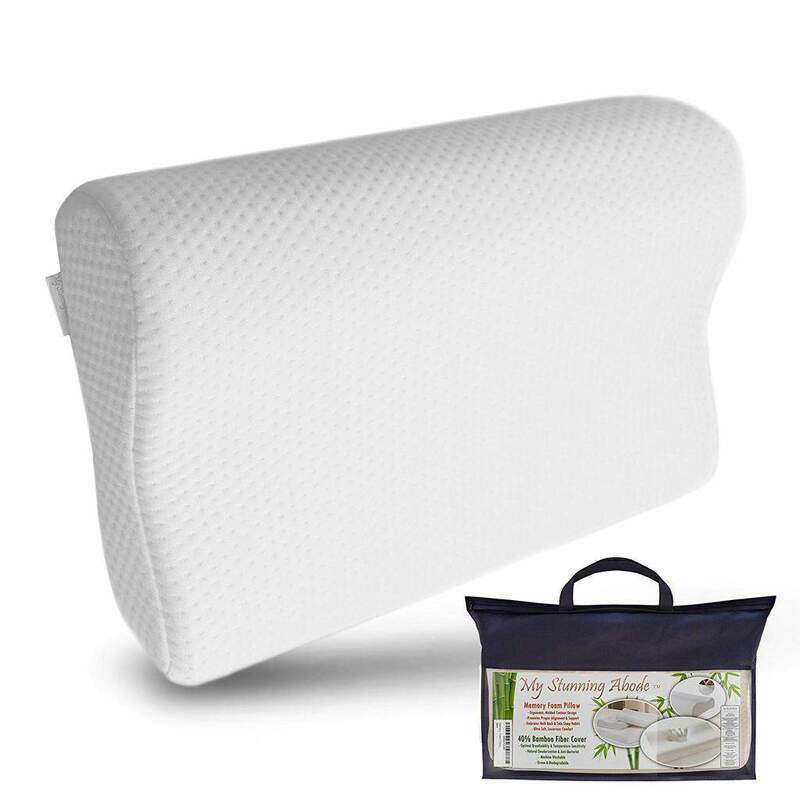 The Premium Foam Pillow cradles the head and neck nicely, providing adequate support. You can move around the foam to make it firmer or softer. It is more suitable for back and side sleepers than stomach sleepers. While it can be used by stomach sleepers, you might want to buy a thinner pillow if you are one, because, although it is adjustable, you can adjust it only so much. The cover is Bamboo blend, soft and breathable. It is also machine-washable, plus the cover can be easily zipped off the pillow, making removing and putting it back very easy. As the pillow is made in the USA, those who prefer homemade items might want to give it a try ahead of other memory foam pillows. The pillow comes with a lifetime warranty. Many foam pillows come with a 3-year or 5-year warranty, but lifetime warranty, well, that’s pretty impressive. Allergy sufferers will like the fact the pillow is naturally hypoallergenic and dust mite resistant.